You won't want to miss our newest arrivals to the Felt Craft Kits section of the store. 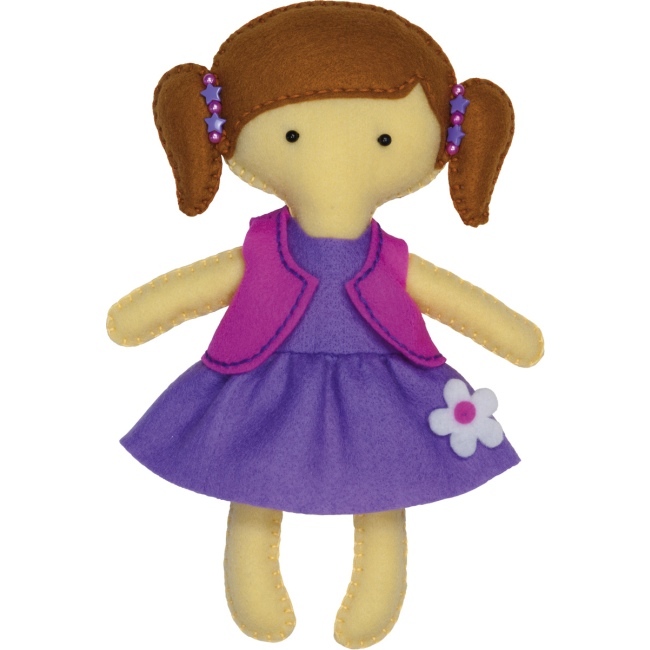 The Feltworks Fun Doll Kits from Dimensions include everything you need to make your own soft doll! 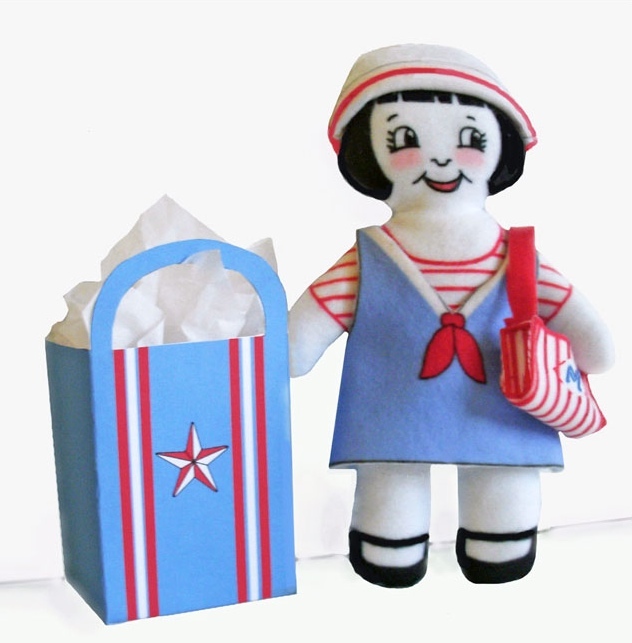 Each felt doll kit includes die-cut felt pieces, cotton thread, bead embellishments, polyester stuffing, needle, and easy instructions. The felt pieces are pre-cut to shape and pre-punched with holes for easy hand sewing & assembly. It's a fun felt craft project for adults and kids ages 8 & up. Felt sewing crafts are a great choice for teaching children how to sew. These complete felt craft kits are also a convenient option for experienced crafters looking for a quick & easy handmade gift giving idea. Surprise a young child with an adorable soft doll made just for them! Visit the Felt Craft Kits section to see our complete selection of felt craft kits, including doll kits, pillow kits, ornament kits, and more. Weekend Kits offers a unique selection of modern DIY craft kits for all skill levels. Stop by today and be ready to start crafting with felt on your next Weekend at Home. Thanks for visiting! Felt Craft Kits - Easy & Fun Felt Craft Projects! 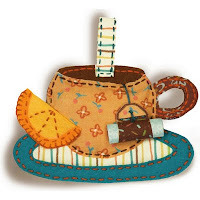 Weekend Kits recently added a new Felt Craft Kits category to the store! This new section will be dedicated to offering a range of fun felt projects for crafters of all ages and skill levels. The Feltworks Fun collection is a new line of felt craft kits from Dimensions, featuring contemporary felt craft projects that are easy to applique and quick to assemble. 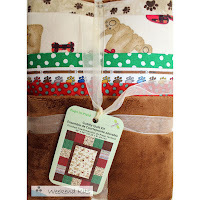 Felt pillow kits, tote kits, ornament kits, and more. 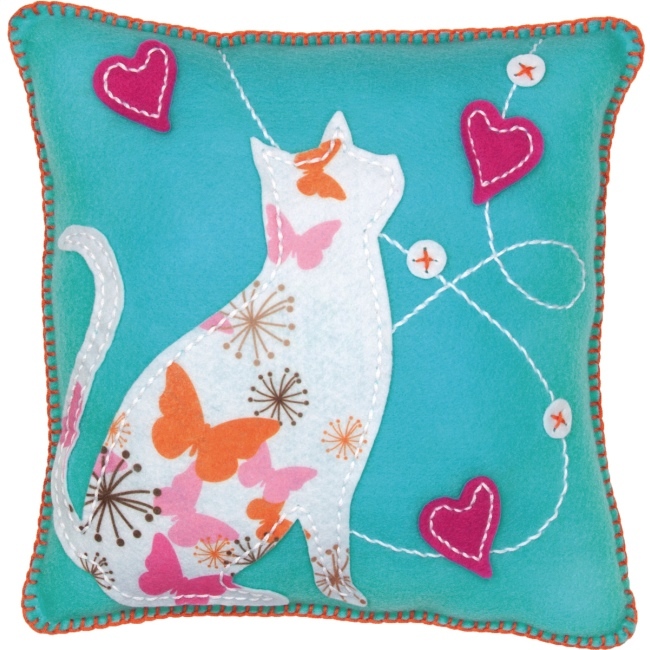 The Cat Pillow Kit includes die-cut felt pieces, cotton thread, polyester stuffing, needle, and instructions. The die-cut felt pieces are a great time saver. You won't need to cut out the individual felt shapes. Die-cut means that the felt pieces are pre-cut and ready to use! In addition, the felt pieces are pre-punched with small holes for easy hand embroidery and assembly. Feltworks Fun pillow kits are a fun felt craft idea for adults, teens, and kids ages 8 & up. They're complete kits with everything you need to finish the felt pillow project. 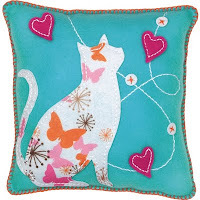 Brighten up a bedroom or rec room with a colorful felt applique pillow handmade by you! The Handmade Embroidery collection is a new line of easy felt & fabric craft kits from Dimensions. 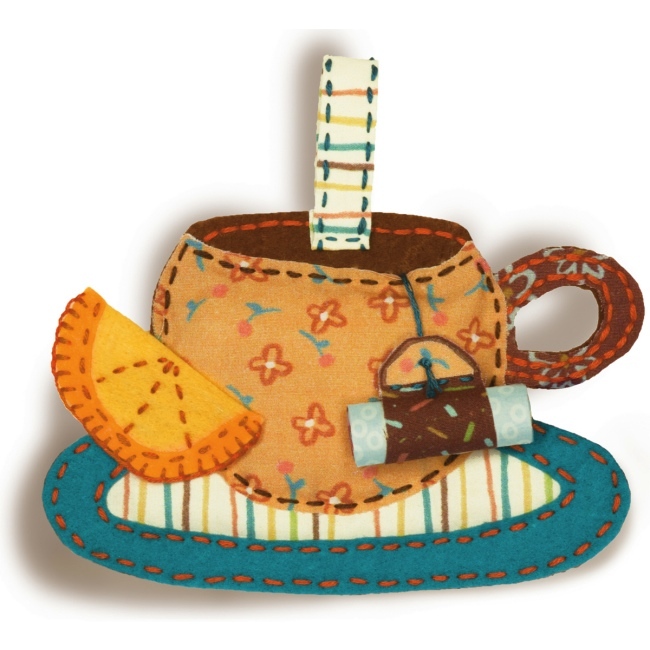 The Teacup Ornament Kit includes printed fabric, die-cut felt shapes, presorted cotton thread, stuffing, needle, and instructions. Not just for the holidays, these felt & fabric ornaments are fun decor any time of the year. Add a small note to the tea bag handle for special handmade gift giving. They're quick & easy hand embroidery kits with all the materials to complete the project - even stuffing is included! 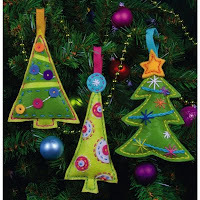 The Cheery Tree Ornaments Kit includes everything you need to make 3 felt Christmas ornaments. Die-cut felt pieces with pre-punched holes makes this is an easy felt applique kit for beginners. Crafting is a great way for families to spend creative time together. Felt craft kits make it easy - you'll spend less time shopping around for craft supplies and have more time for creating! Visit our new Felt Craft Kits section for details on these kits and to see our complete selection of easy & fun felt craft kits for beginners & experienced crafters too. We'll be adding new kits soon, so be sure to check back for new arrivals. Weekend Kits offers a unique selection of Art & Craft Kits across a variety of crafting categories. Kits make crafting convenient, easy, and fun. Stop by today and be ready to create something new on your next Weekend at Home. The June Craft Kit Giveaway has ended - be sure to check back for future giveaways! The winner of the June Craft Kit Giveaway is Five Little Crafty Birdies. Congratulations! Please Contact Us with your shipping information and we'll have your prize out to you right away. Thanks to everyone who entered the giveaway. Please stop by now & then for updates on new product arrivals, promotions, and giveaways! It's time for the June Craft Kit Giveaway at Weekend Kits. 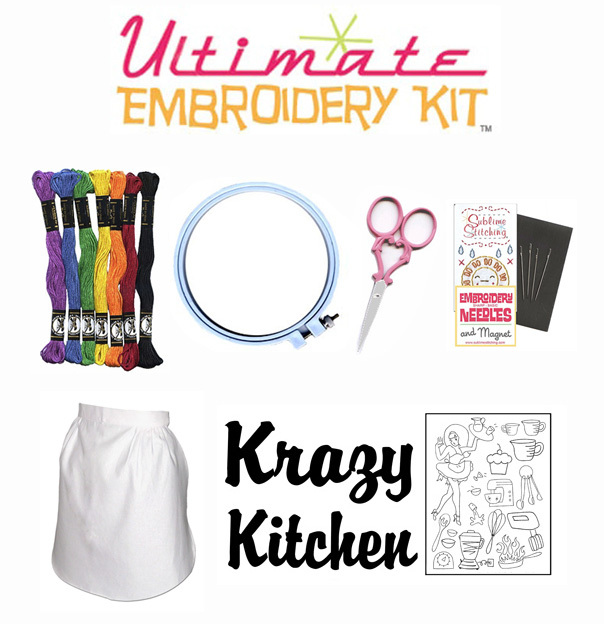 You can enter to win an Ultimate Embroidery Kit from Sublime Stitching. This beginner embroidery kit includes everything you need to learn how to hand embroider – tools, supplies, patterns, and instructions! It's easy to see why this is such a popular embroidery starter kit. Jenny Hart, founder of Sublime Stitching, designed this amazing kit with the total beginner in mind. Take a look at everything you get. • Half Apron - Ready to Embroider! Perfect for beginners and a fun DIY embroidery project for experienced stitchers too! 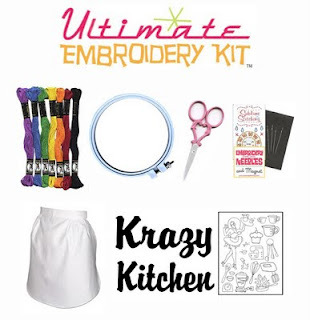 Visit the Embroidery Kits section of the store for details on how to customize your Ultimate Embroidery Kit. There are 3 ways to enter. You can enter 1, 2, or all 3 ways - in any combination. Each entry, up to 3 total, is another chance to win! 1) Leave a comment telling us about your favorite kit at Weekend Kits. Your comments will help choose next month's giveaway prize. 2) Like us on Facebook AND leave a comment here letting us know you did. If you already like us on Facebook, just leave a comment letting us know and this will count as an entry. 3) Follow us on Twitter AND leave a comment here letting us know you did. If you already follow us on Twitter, just leave a comment letting us know and this will count as an entry. • You have until Thursday, June 23 at 12:00pm (EDT) to enter. • Open to US & Canada shipping addresses only. The winner will be announced here on Friday, June 24. We don't collect email contact information at time of entry, so it's important that you check back here to see if you won. It might be helpful to add a reminder to your calendar. Updates are always posted on our Facebook page, so if you've joined us there, you're set! If you include email info in your profile or within your comment, we'll send you an email if you win. Winner will have 3 days to Contact Us with their shipping info to claim their prize. Weekend Kits specializes in modern DIY craft kits for beginners & experienced crafters. Our goal is to help make crafting convenient, easy, and most of all FUN for everyone. Good Luck Crafters! 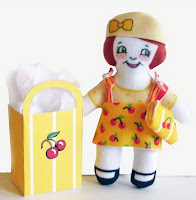 Here's a fun new line of DIY Doll & Clothes Kits from Connie Lou Fabrics. They're called the Muffet Girls and there are three unique dolls in the collection – each one an original design. You'll find them in the Sewing Project Kits section of the store! 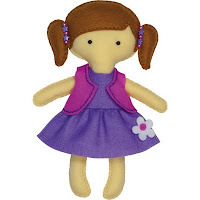 This is an easy hand sewing kit for you to make your own soft fleece doll with coordinating clothes & accessories. It's an ideal sewing project for teaching kids and beginners of all ages to learn how to sew. Sewing craft kits with patterns, materials, and instructions make it convenient, easy, and FUN to learn this creative & practical life skill! 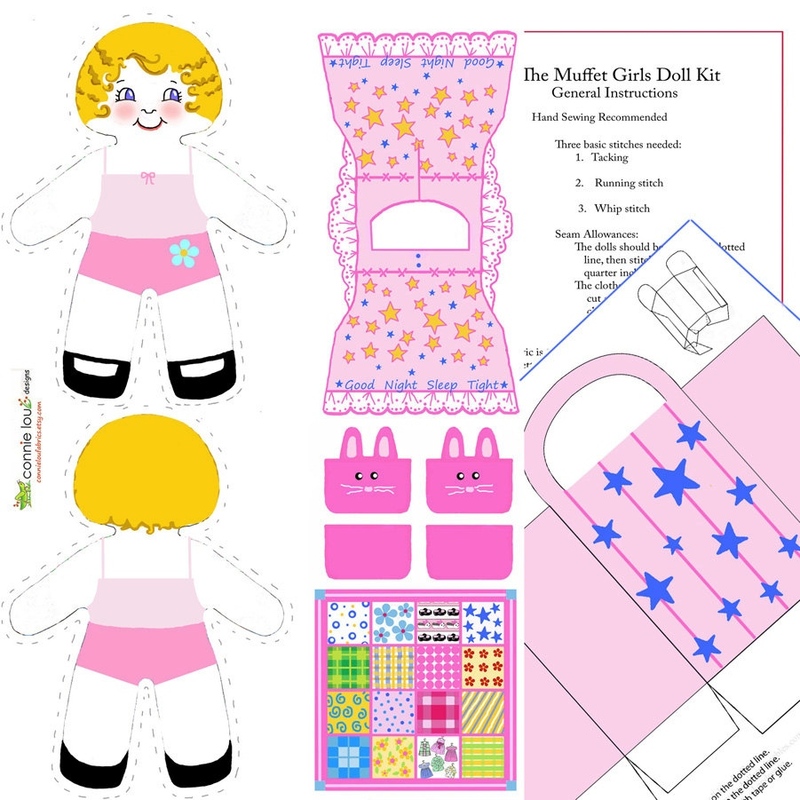 Each kit includes 100% Polyester fleece fabric pre-printed with the doll & clothes pattern pieces, complete instructions, and a cardstock cutout for you to make a fun paper craft shopping bag for your doll. The sewing process is as easy as 1-2-3! Simply cut the pattern pieces from the fleece fabric, sew them together, and add stuffing. Easy instructions guide you through the project and even provide simple diagrams of the basic sewing stitches used for assembly. The finished size of the Muffet Girls doll is approx. 8-inches tall. You need to have a few basic sewing supplies on hand for your project, including a hand sewing needle, thread, pins, and scissors. You also need to have some stuffing material, such as polyester fiberfill, to finish your plush doll. 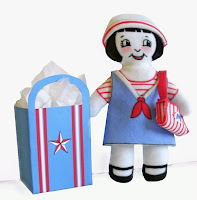 Experienced crafters will also enjoy the quick & easy nature of these creative ready-to-sew doll kits. Perfect for handmade gift giving! 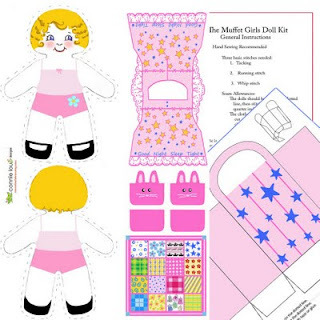 Visit our Sewing Project Kits section for details on the Muffet Girls Doll & Clothes Kits and to see our complete selection of sewing craft kits, including hand bag kits, apron kits, plush animal kits, and more. Weekend Kits is excited to offer a unique & creative selection of modern DIY Craft Kits from independent artists like Connie Lou Fabrics and many others. Stop by today and be ready to start sewing on your next Weekend at Home! Baby Quilt Kits – Our Best Ever Selection! 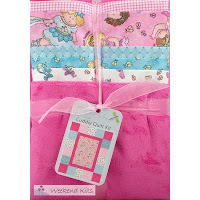 You'll find our best ever selection of Cuddly Quilt Kits in stock now at Weekend Kits. They're modern DIY quilt kits for beginners & busy quilters. See them all in the Baby Quilt Kits section of the store! 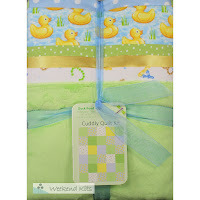 Cuddly Quilt Kits from Fabric Editions are coordinated collections of kid & baby themed fabrics with simple quilt patterns and easy instructions. Cuddly quilts include a nice variety of fabrics, such as premium cotton, soft flannel, and textured plush. Varying fabrics enhance the look as well as the feel of the quilt. Baby's little hands will enjoy exploring the different textures. These soft baby quilts are perfect for cuddling baby and they add a splash of color for accent decor too. Designer fabrics & contemporary color combinations make these quilts a perfect choice for baby's nursery or a child's bedroom. But, the best thing about these quilt kits is that they're super easy! The quilt tops are simply pieced designs, as pictured on the tag in the photo. The quilting instructions provide helpful tips & important information about fabric care, iron settings, and seam allowances. It's a good idea to read through all of the instructions before starting your quilt project. Cutting the Fabric Pieces – rotary cutting tools, including rotary cutter, cutting mat, and quilt ruler. Sewing the Blocks & Quilt Top – quilting pins, sewing machine, thread, iron & pressing cloth, seam ripper, and scissors. Finishing the Quilt – the instructions use a turn-inside-out method for finishing the quilt without batting or binding. Many quilters prefer to add batting for extra loft. You'll find many of the supplies you need in the Quilting Supplies section of the store. If you're not sure how to add a batting layer when doing the turn-inside-out quilt method, this helpful Baby Quilt Tutorial on the Cloud 9 Fabrics blog provides step-by-step guidance. Experienced quilters may prefer to use a different finishing method altogether. If you decide to add binding, you'll need to supply the binding material. Some quilters make their own binding, while others purchase pre-made quilt binding in a coordinating color. Either way works well. Your finished quilt will be a wonderful handmade gift for baby and children of all ages. Visit the Baby Quilt Kits section to see the complete line-up of these cuddly quilts for baby. They're an easy quilt kit for beginners and a convenient option for experienced quilters too! Weekend Kits specializes in modern DIY Craft Kits for all ages and skill levels. Stop by today and be ready to make a soft & cuddly blanket for baby on your next Weekend at Home.